Intel's new NUC kits join other eighth-generation options such as the Hades Canyon gaming NUCs that rolled out in the spring. Fans of tiny PCs have some interesting new toys to play with. 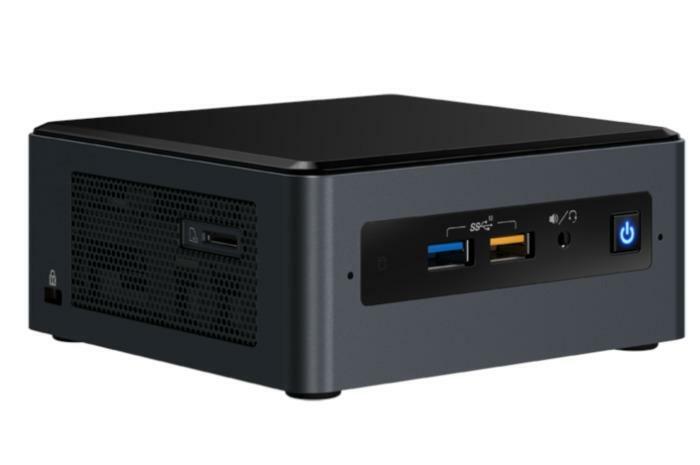 Intel announced several fresh bare-bones NUC kits rocking eight-generation Core processors late Wednesday, as well as two interesting NUC mini-PCs that introduce several firsts to the mainstream Next Unit of Computing lineup. Christened the NUC8i3CYSM and the NUC8i3CYSN, both palm-sized computers (pictured above) come equipped with the 2.2GHz, dual-core “Cannon Lake” Core i3-8121U, bringing chips built on Intel's beleaguered 10nm process to small form-factor PCs for the first time. Like the low-volume Chinese laptops that Cannon Lake CPUs originally appeared in, the NUC mini-PCs rely on discrete graphics rather than an integrated solution. That's another first for mainstream NUCs, though the AMD Radeon 540 GPU inside isn't anywhere near as powerful as the custom Radeon Vega graphics inside the enthusiast-class Hades Canyon NUC. Intel says the mini-PCs can play e-sports like League of Legends and Counter-Strike: Global Offensive at 1080p resolution, however. The NUC mini-PCs come with everything you need to get going, with either 4GB or 8GB RAM, a 1TB hard drive, and Windows 10 Home. The boxes have two HDMI ports, four USB ports, and 802.11ac Wi-Fi, and can support two storage drives. Pricing was not announced. The new NUC kits are shorter than the fully stocked NUC mini-PCs. Intel also announced five new NUC kits for creating your own mini-PCs. These "bare-bone" boxes come with the itty-bitty chassis, motherboard, ports, and processor, but you'll need to add your own RAM, storage, and operating system. Prices start at $300 for the Core i3 devices. The new models–NUC8i7BEH, NUC8i5BEH, NUC8i5BEK, NUC8i3BEH, NUC8i3BEK–rock Core i3, i5, or i7 processors depending on the model, built using the established 14nm "Coffee Lake" architecture rather than Cannon Lake. There are actually only three processors to choose from: the 2.7GHz, quad-core Core i7-8559U, the 2.3GHz quad-core Core i5-8259U, and the 3GHz, dual-core Core i3-8109U. All support HyperThreading. The NUC kits include Intel’s Iris Plus Graphics with eDRAM, making them ideal for home theater PCs as well as diminutive desktop rigs. Other basic specs include support for up to three displays via HDMI and USB-C, m.2 storage slots, a microSDXC card slot, and four USB ports (two USB 2.0 and two USB 3.0). All of the NUC kits and mini-PCs will start appearing at online retailers in September.